Book now the best shore excursions in Montecarlo and Monaco. High quality and safety at the lowest prices. If your are looking for Shore Excursion Montecarlo Monaco, book now the best guided tours at lowest price with Ancora Tours. Since 2003 we offer you official guides in english, transportation and travel insurance, all included. The highest quality at the lowest rates. Our shore excursion in Monaco and Monte Carlo will take you to the principality of Monaco, one of the most exclusive locations in the world. Its modern side attracts Formula 1 fans and Grace Kelly enthusiasts, but history buffs won’t be disappointed either. What’s eating: Pistou; a Provençal cold sauce made from cloves of garlic, fresh basil, and olive oil. Souvenir: You’ll find a number of knick knacks emblazoned with the Ranieri family coat of arms. Dress Code: Please note the dress code recommended to enter any church (and also to enter the Casino). No shorts, bare shoulders or miniskirts. This applies to both men and women. Comfortable walking shoes are recommended. We’ll meet our guide for the shore excursion of Monaco and Montecarlo at the port. We’ll head towards Monaco, driving along the Côte d’Azur for about 35 minutes. In order to reach La Rocca, the rocky headland home to the Prince’s Palace it’s necessary to take an elevator. Built in 1191, the palace was originally a Genoese fortress and has been attacked many times throughout its turbulent history. Our walking tour of Monaco begins with an external visit to Saint Nicholas Cathedral. This neo-Romanesque church is the burial place of many of the Grimaldi royal family, including Prince Rainier III and Princess Grace Kelly. Next, we’ll stop to admire the Oceanographic Museum, a grand and impressive building that rises from the cliff face. After there’s some free time to spend wandering in the charming streets of the old town, perhaps even visiting the cathedral interior as well. Our shore excursion will conclude with a panoramic bus tour of Montecarlo. We’ll take in the main sights including the harbour, Cafe de Paris and Montecarlo Casino. 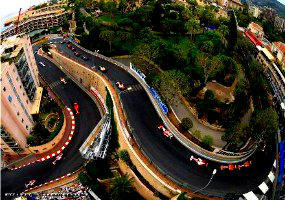 This square is the most famous spot of Montecarlo also forming part of a Formula 1 circuit .